Shut up about Barclay Perkins: Let's brew (Whitbread 1923) PA! This recipe is mainly for comparison purposes. To let you see how Whitbread's IPA related to their PA. The IPA was considerably weaker (1036 as opposed to 1046 for the PA), but had more hops and was more highly-attenuated. The ingredients used were pretty much the same: English 2-row pale ale malt, American 6-row pale malt, no.1 brewing sugar and East Kent and Mid Kent hops. Interestingly, the PA had a higher proportion of sugar than the IPA. 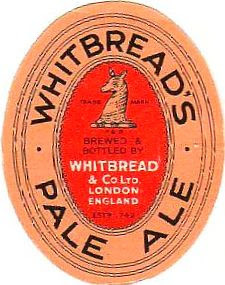 PA was Whitbread's standard draught Bitter. IPA was their biggest-selling beer, but was only available in bottled form. Whitbread's PA was a little on the weak side. More typical was a gravity of 1048, but some London brewers, such as Watney and Barclay Perkins, brewed their PA to a gravity of over 1050. The dry-hopping is a guess, based on the practice at Barclay Perkins. Whitbread PA would certainly have been dry-hopped. Unfortunately, their brewing logs make no mention of dry hops. This isn't unusual. Barclay Perkins are the only brewery I've come across so far that did bother to. If I carry on at this rate you'll soon be able to recreate the whole Whitbread 1923 range. Now Wouldn't that be fun? I'm still trying to decide on tomorrow's recipe. I'm torn between 1923 Whitbread KK and Whitbread's two 1955 Brown Ales, Double Brown and Forest Brown. Do you have any preference? Brown Ales, please. I love these recipes, very interesting and I'm working up a brew session using the mild recipe. Brown Ales it is then. Another very valuable one. Thanks for this. I'd alos like to see some Brown Ale, but I was goign through past posts and have a wish list of some of the beers you mentioned in the past that stood out to me. I could likely figure out grain bills and hop rates from what you've already posrted, but it's great to have your insights into mash temps and techniques, etc. I certainly don't expect you to do recipes for all of them (or any of them if you don't want to), but you had asked. I'm particularly interested in some of the SS recipes since I've worked one of them up myself that was a composite of various different recipes. I also think it's be interesting to see side by sides for some similar beers from similar years (like the 1850 Trumans porters and stouts). Thansk as always for all of your work. It's greatly appreciated and incredibly insightful. Ron - Here is my Guestimate for PA 1923 Jan 9th. The Neame CS EK is some concern, but I'm thinking they are Goldings also. The hops come in @ 2% Alpha.